On the surface of it, you might just think 'oh, design service. Someone will design pretty clothes for me'. I wish it was that simple! The scary thing is that this is a common misconception about the fashion industry, even from designers who haven't worked in the 'real' side of fashion. It is a business and as such, absolutely everything you do has to be business focused. 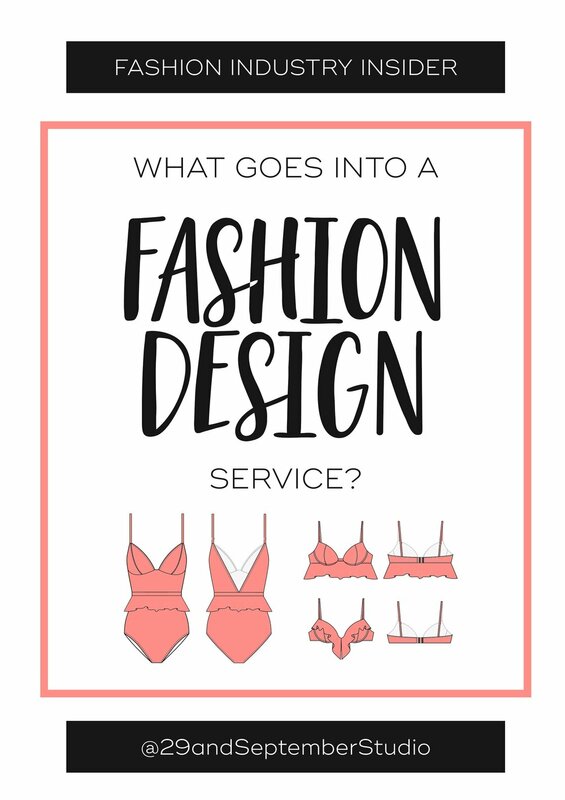 It would be lovely to just design whatever you'd like, but the reality is that each item must sell for a good profit, otherwise you'll find yourself bankrupt in little to no time. Even the multi-millionaire daughter of a Beetle, Stella McCartney, has to design around a business focus in order to sustain a brand. I've been fortunate enough to work in lots of different areas of the fashion industry and this has led me to work in a different way to many others, because I foresee the production problems while still in the design stage. If you've never been a pattern cutter, sample maker, or production manager and have always stayed in design, it's easy to keep passing your designs on, blissfully unaware of the nightmare that you're causing the factory. So when I'm designing a range for you, what do I take into consideration? 1. Who am I designing for? This is where you, as a client, can be very helpful. The more information you provide on your target customer and the type of brand you're trying to create, the more I can tailor the designs to you. I provide a designer briefing sheet to help you get your ideas and customer across, be as detailed as you can with this. I'm sorry if it feels like I'm giving you homework, but it's for the best, I promise! Let's take an example. A customer approached me to design a new swimwear line and sent some examples of string bikini styles they liked, but didn't want to tell me anything about their customer. So I took inspiration from the string bikini. They later told me that the range would be available in plus size cups.....had I known that before, I would have told them why a string bikini isn't a good idea for this market and would have designed accordingly. I wouldn't have expected them to know this, 'you don't know what you don't know', but if they had been open about they're customer I could've created better designs, suitable for them in particular. You might feel that some of the questions on the sheet are a bit useless, but in all honesty I developed that sheet after years of experience and can assure you that each question is totally valuable, so the more you can tell me, the more I can work for you specifically. One of the questions you might find odd is 'retail price range', you might be thinking 'well, the price will depend on the price I get from the factory'. Please never think this and don't allow the factory to dictate your retail prices! I'll be covering this topic in more depth in an upcoming blog post. You, or your market research should determine the retail price. For example, if you'd like me to design a range to sell for £10-£50, the fabrics and techniques I choose will be very different to one that sells for £70-£300. To the client, it may look as though the price doesn't really affect the deigns, but this isn't the case at all. Subtle variations, such as construction and fabrics can make a huge difference to the price, all of which are considered when I design. I like to present designs to clients that are commercially viable and it's no help to anyone if I present 100% silk styles to someone who wants to sell for £30 - they will never be able to get this into price. 3. How will this be manufactured? Each design I submit has been considered from a pattern cutter, sample maker and factory perspective, even if you're not getting any technical services from me. I see so many designers submitting work, which ends up coming to me for correcting, as the designer hasn't considered how to make it and later realise it's not actually possible. Let's take a simple example, a customer came to me recently for a consulting session. Someone had done designs for her, but the factory we're really struggling to understand what they were making. The answer was simple; the designs didn't have a back view, an individual view (coats were covering the tops, so you didn't know if they were long sleeve, short sleeve, etc) and as they were presented as fashion illustrations, they were disproportionate. I love fashion illustrations and think they could be a great addition to branding, marketing, social media accounts, etc. However, in the manufacturing world they are very confusing. Fashion illustrations are usually disproportionate and are essentially 'stretched out' about 20%, so the legs and torso are much longer than on a real body. This makes it hard for anyone trying to produce the garment to identify the true proportion. That's why I always present my work as 'flat' CAD drawings that are easy to understand and provide a front and back drawing as standard. I appreciate this doesn't look as exciting as a fashion illustration, but you have to ask yourself if you want exciting, or if you want to actually get a finished piece of clothing. I also consider things further down the track, into pattern cutting and production. This is something that you won't see in the designs, as basically I won't send anything to you that'll be really hard or impossible to produce. This makes it easier for clients, as they don't have to consider their factory, they can just make selections based on personal preference. 4. When is the range for? Another question I ask is, when are you launching the product. This is both so that I can take into account any trends and also so that I can choose suitable fabrics and make sure the collection is seasonally appropriate. Something important to note about trends; I don't believe in being a slave to them and the use of trends will come back to the target customer. I believe there's a big difference between 'trend led' and 'trend relevant'. For example, if I'm designing for a fast fashion company appealing to 16-25 year olds, trends will play a key part in the design process. If, however, the range is evening wear for the over 50's, trends will still be considered, but they won't be the driving force. In most cases, unless the client requests differently of course, this type of design would be something I call 'trend relevant', meaning the designs fit in with the season's styles, but also have a timeless quality and won't date quickly. 5. How will this work together as a range? 'Range building' is one of the most important things to get right, in order to increase the company ATV (average transaction value), UPT (units per transaction) and generally lead to greater profits in the business. By making sure that the collection works together as a range and is interchangeable, you can encourage customers to make additional purchases. For example, they might be looking for a top, but could end up adding the trousers and/or jacket to complete the look. Or, they might buy the kaftan that compliments the bikini set. The other thing to consider when designing a range, is how many of each category (e.g; top, bottom, dress, etc) and also the price (again!) structure. I look into sales data for various market sectors and will use the one relevant to the target audience I'm working with to decide on both the breakdown of categories and also how many items are low, medium and high priced (whatever those prices may be according to the client's retail price range). This can all get a bit overwhelming (sorry if I lost you at ATV), but essentially, I can worry about this so you don't have to. 6. How will this be perceived by the press and buyers? Another thing to consider is how the collection will look to professionals. Of course, the range will be customer focused, but in order to get the product in front of customers, it needs to get some publicity. This is also a reason to keep the range trend-relevant, even if you're not interested in being trend focused, as magazine editors and bloggers will be working to a specific theme. Press are also inclined to seek 'special' pieces, known to designers as the 'press piece'. The press piece isn't usually the bestseller, but it gives the brand exposure and publicity and is a style that customers aspire to own; more on this topic in a future blog post. Buyers will of course consider price, but also how the clothes work together and how they can be merchandised (displayed together for maximum impact and profitability) in store. I, therefore, also consider these things in order to produce a fashion range that can appeal to press and buyers, as well as your customer. I wanted to clarify that all of the above is included as standard with any designs that I create. Essentially, you're getting advice as I'm considering all of these things for you, but we're not necessarily having a discussion about it. This allows you to choose designs in confidence, based on your personal preferences without having to consider all of the above. If you want to make some changes but not sure if they'll work, I'm more than happy to tell you if they're suitable and achievable. I hope this post has given you some insight into all of the decisions and considerations that go into each and every design I create. If you'd like to ask any questions, you can send me a message here. There’s also a full list of the services I provide, which you can view by clicking here.